Madison the City Chamber of Commerce—which is comprised of businesses, professionals and volunteers whose mission is to advance the city's economic vitality and quality of life—presented the 2017 Large Business of the Year Award to St. Catherine's Village. Madison, Mississippi, January 31, 2018	(Newswire.com) - In January, Madison the City Chamber of Commerce named St. Catherine’s Village the city’s Large Business of the Year for 2017. 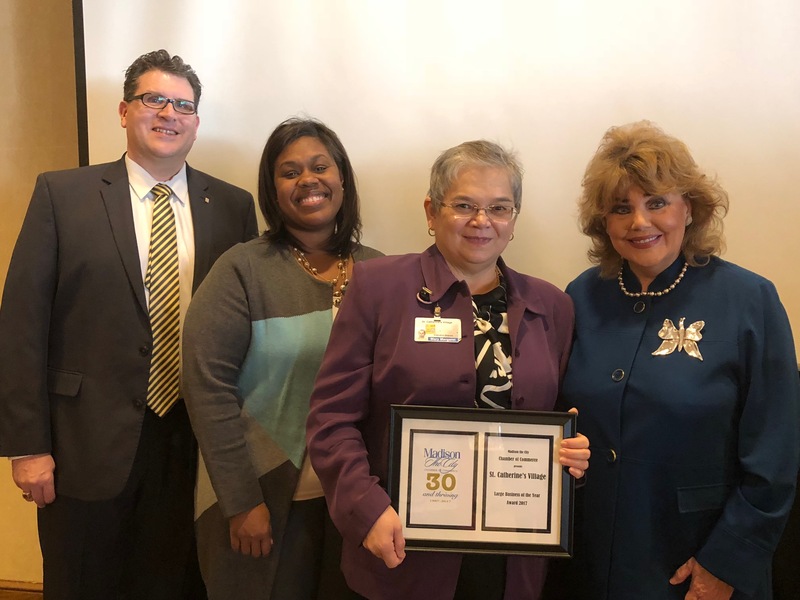 Mayor Mary Hawkins Butler presented the award to Mary Margaret Judy, executive director; Felichia Fields, assistant executive director; and Scott Kersh, chief financial officer at St. Catherine’s Village. The continuing care retirement community (CCRC) offers unparalleled facilities, beautiful outdoor spaces, a thoughtful staff, resident-centered care, and a mission-focused environment. To qualify as a certified retirement city, Madison passed a three-month intensive screening process conducted by Hometown Mississippi Retirement, the state's official retiree attraction program. The city was evaluated on several criteria important to retirees: cost of living, tax rate, low crime, quality medical care, recreation, educational and cultural opportunities, and most importantly—a warm, welcoming atmosphere. Madison, which celebrated its 30th anniversary in 2017, also has been awarded the seal of approval by the American Association of Retirement Communities and is nationally ranked as one of the best retirement locations in the country. Both the chamber of commerce and the city actively promote Madison as a retirement haven. St. Catherine’s Village is no stranger to awards, itself. In 2017, it was named Best Retirement Community and Best Assisted Living Facility by the Clarion Ledger—recognition it received in 2016 and 2015, as well. In addition, Keep Mississippi Beautiful acknowledged the St. Catherine’s Village “Green Team” for its exemplary efforts in keeping Mississippi beautiful two years in a row. Furthermore, the all-inclusive life care community was the first in the state to earn accreditation by CARF-CCAC. This “commitment to excellence” seal signifies that the campus exceeds the standards established by the only international accrediting body for CCRCs. Furthermore, Campbell Cove and the Hughes Center are both licensed by the State of Mississippi as “Alzheimer’s Assisted Living” facilities. All adults 62 and older are welcome at St. Catherine’s Village, where they are encouraged to enjoy fullness of life, health and faith. Housing options include independent living in apartments and garden homes, assisted living in Marian Hall, memory care in Campbell Cove and Hughes Center, and skilled nursing in Siena Center. St. Catherine’s Village now offers skilled nursing dedicated to memory care, as well. In each lifestyle stage, residents pay a monthly fee that covers utilities, services and amenities that make living comfortable, carefree and secure. In addition to companionship, St. Catherine’s Village offers enriching activities with an activity director who coordinates a variety of clubs, groups and events to keep residents engaged, energetic and excited. The property boasts 160 acres of wooded grounds along with 24-hour on-duty security. St. Catherine’s Village is a service of St. Dominic Health Services, Inc. and is sponsored by the Dominican Sisters of Springfield, Illinois, who have owned and operated St. Dominic Hospital since 1946. With independent living, assisted living, skilled nursing, and memory care, St. Catherine’s Village provides the right care at the right time for those in their retirement years. For more information, call (601) 856-0123 or log onto www.StCatherinesVillage.com. About Stevens & Tate, Inc.
Stevens & Tate Marketing is a digital agency specializing in meeting the ever-changing demands of today's consumer. As experts in all areas of Internet Marketing, we know how to navigate through evolving trends and technologies for today. Press Contact Stevens & Tate, Inc.
New residents who move into Campbell Cove by March 1, 2019, with a rental contract for memory care assisted living can save 10 percent on monthly service fees for one year.